Today, my Natalie will turn 8. It’s cliché, but it doesn’t seem possible. 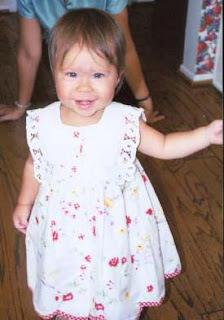 I remember vividly the day she was born and our lives were forever altered as Corey and I became first-time parents. On the other hand, she is so deeply ingrained in my head and my heart, it’s hard to remember a day without her. So today, to celebrate her, I’m telling 8 of my favorite things about Natalie. My favorite Natalie story comes courtesy of one of my closest friends back in Tiny Town. She has a son who is close to Natalie in age. When they were both turning 5 and preparing for kindergarten, Sonjia volunteered to watch Connor for the morning so I could take Natalie to her first-ever dentist’s appointment (a required pre-school thing here in Minnesota). Sonjia was also hoping Natalie’s casualness about the appointment would rub off on her son, Chase, since he was terrified of the upcoming date. The morning went well. Natalie was apprehensive at first, but she warmed up to the friendly dentist quickly. She enjoyed the x-rays of her teeth, and getting to pick her own flavor of gritty tooth polish and the cool chair they let her control. By the time we got back to Sonjia’s to pick up Connor, she was brimming with happiness about her latest adventure. After we left, Sonjia mentioned to Chase that Natalie seemed OK with the dentist appointment. “I don’t think you have anything to be afraid of Chase. Look at how well Natalie did!” she said. The word used most often to describe Natalie is “sweet.” It’s an apt description. Every single Sunday, she saves part of her snack from Sunday school to give to her younger siblings. “I’m saving this for my little brother and sister,” she announces, as she rolls up a few errant Goldfish and a chocolate chip cookie into a small napkin. She’s incredibly easy-going. She’s almost always happy. She’s quick to laugh and even quicker to smile. She delights in being cooperative and in helping me when I need an extra hand. She’s sweet. Just like the little girl in the nursery rhyme -- sugar and spice and everything nice, that's what my Natalie is made of. But don’t let the sweetness fool you. She’s not a timid wall-flower. From the time she was little, Natalie has had no fear. As she’s grown up, she’s learned to temper her natural curiosity and verve with a healthy dose of caution. She wears a seat belt, doesn’t run into traffic and tries to avoid skinning her knee. But if there’s a water slide, a roller coaster or an extreme ride in the area, she’s all over it. She loves the adventure and the thrill. This is where I’m going to come across as an over-proud mother, but I think people who know Natalie in real life will back me up on this: Physically speaking, she’s gorgeous. Ever since she was a baby, people would look at her and say, “Wow. You’re going to have to watch out for that one.” And it’s true. With her happy smile, almond-shaped hazel eyes, dark skin and brown hair, she’s a beauty. But – and here’s the thing – she doesn’t know how gorgeous she is. Except for the times when she basks in her father’s adoration of her new dress or hew new necklace, she seems almost self unaware. Which makes her beauty shine all the more. She also loves a burrito at Chipotle. (She makes her own with small tortillas and sides of black beans, cheese and rice.) She’ll happily eat almost any vegetable – carrots, sugar snap peas, yellow bell peppers and edemame top the list. But she doesn’t like a great variety of fruits. Mostly just apples and melon. All berries are a no-go, and we don’t even say the word banana around her lest she break out in a wail. And she doesn’t like breakfast. Being a person who eats most of my calories before noon, this pains me to admit, and I’ve certainly done all I can to covert her. But I think I’ve lost this battle. She just isn’t hungry in the mornings. (Like her father before her.) I comfort myself with knowing she’ll eat a big and healthy lunch. 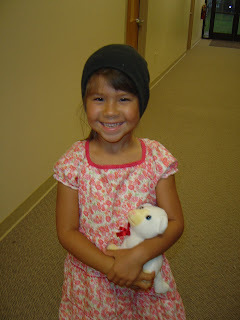 Corey's favorite story about Natalie comes from her pre-kindergarten check-up. I don't know if everyone has to do this, but here in Minnesota, we are required to fill out an extensive form on our kids' physical, mental and developmental progress before we see the doctor. Part of the form has a series of questions we are supposed to ask our child. We then write down their answers word-for-word. So, being a rule-follower, I dutifully asked Natalie, "What do you do when you're hungry?" "Go get a snack," she replied. "And what do you do when you're tired?" "Get my blanket," she said. " And what do you do when you're cold?" "I go to Daddy." Which made Corey choke up. And then, during the appointment, when the doctor was talking to Natalie about good nutrition, she asked her, "Do you know why you're growing up so healthy and strong?" "Because my Mommy and Daddy love me," she said matter-of-factly. Which made everyone in the vicinity wipe away tears. And tonight, when we celebrate with the few family members we have in town, we’ll color and paint and glitter glue some big signs that say “Happy 8 Natalie.” She’s excited to “watch the grown-ups try art,” as she says it. And of course, Natalie wouldn’t be Natalie without her big heart for animals. She has wanted a pet since she was a toddler, and without giving away the ending to my Sami story, I can say she’s a great pet-owner. She doesn’t mind the hassle or the hair or the bad breath. (Which could also describe me before I’ve had a shower, now that I think about it.) She’s thrilled to have a creature to love. Which also describes me, come to think of it. Natalie, you made me a Mom and irrevocably changed the landscape of my heart. You are my buddy, my delight, my sweet little girl. Every day, I thank God for the gift of you. I pray you will continue to grow in His strength, His wisdom and His joy. Happy Birthday! Oh, Kelly, so beautifully written. I must grab a kleenex now. And a BIG HAPPY BIRTHDAY goes out to sweet Natalie! Enjoy the day! What a precious young lady. She is blessed to have you as her mommy. Sniff, sniff...and you know I mean it. Hug and kiss her for us, please. Happy birthday to our favorite 8-year-old princess. We love you, Natalie!!! "because my mommy & daddy love me." unquestionably precious! Happy birthday to sweet Natalie! A beautiful post about a beautiful young lady--inside and out. Happy birthday to Natalie! So precious and sweet. Happy Birthday to your big girl! What a phenomenal post about Natalie. I hope you will read it aloud to her or print it in a card or something. And happy 8th birthday to her! You had to have at least 8 comments for your favorite 8 year old so here's mine--Happy Birthday, Natalie. those of us with all boys appreciate how much your mom does to share & exemplify the beauty of girlhood. Makes me work all the harder at raising a godly young man to one day win a girl like you. Happy eighth birthday Natalie! I love your kind heart. Awww, Happy Birthday to Natalie! Your daughter is a beautiful jewel. The Lord must really, really love you. She sounds as sweet as can be. God bless her heart!